Pool sanitization is much more than chlorine these days. We’ve taken the liberty of outlining a few ways to keep your swimming pool crystal clear all year around. 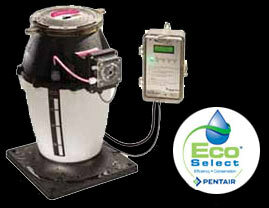 Pentair offers a variety of products designed to help pool owners maintain a healthful and sanitized pool environment. For keeping your pool sanitized with a minimum of inconvenience, you can’t beat an automatic chlorine/bromine feeder. The Rainbow Models 300 and 320 feeders not only save time but also reduce manual handling of chemicals. They use large or small trichlor or bromine slow-dissolving tablets to make sanitizing your new or existing pool or spa easy and automatic. Both install easily on the pressure side of the pump, downstream of the filter and heater. The freestanding Model 300 feeder and the in-line Model 320 feeder both feature an external fine-control valve that lets you adjust the feed rate to meet specific pool or spa requirements. Completely enclosed system—No escaping fumes. Operates on pressure side of pump. Holds approximately 4.8 lbs. of large or 3.5 lbs. of small Trichlor or Bromine tablets or sticks. Can treat from 12,000 to 48,000 gallons. 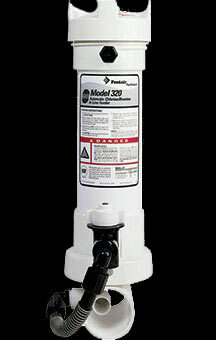 Also available in 19″ and 29″ models for treatment capacity up to 56,000 gallons. NSF listed for public or residential pool, spa, or hot tub use. Also available in clear for ease of table viewing. IntelliChlor® Salt Chlorine Generator uses common table salt to produce all the chlorine a pool needs, safely, effectively, and automatically. Same sanitation performance as manual chlorine addition without the drawbacks. No need for customers to buy, transport and store chlorine compounds. It provides you full diagnostic capabilities and push-button operation with easy-to-view displays that enable fast checking of salt levels, cell cleanliness, sanitizer output, and water flow. 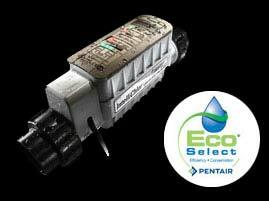 The IntellipH pH controller is the perfect companion for the intelliChlor Salt Chlorine Generator. It automatically dispenses muriatic acid to balance your pool’s pH while the IntelliChlor generator creates pure chlorine from salt, right in the swimming pool. The IntellipH controller eliminates fluctuations in pH level, protecting your pool equipment from corrosion caused when pH swings in and out of balance. The intellipH controller assures more effective sanitization, resulting in pool water that’s easier on swimmer’s eyes, hair and swimwear. The Clear O3® water purifying system is the perfect addition to any new or existing pool for the cleanest water possible. 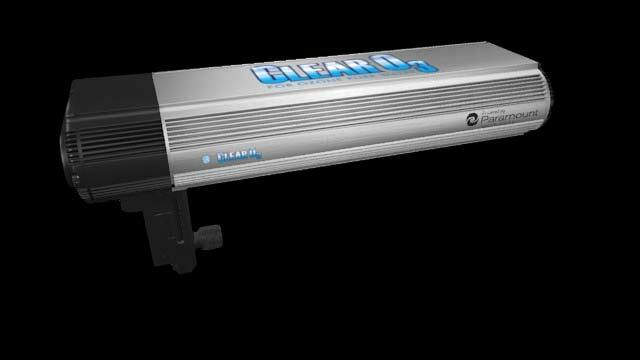 The cylindrical chamber of the Paramount Clear O3® system is optimized for maximum ozone generation and is sealed to minimize ozone leakage so it effectively adds more ozone with less airflow to the pump. Adding a Clear O3® system to a pool adds a cleaning process similar to the process for purifying bottled water, and also reduces the demand for pool chemicals by up to 70%. The Clear O3® uses a powerful UV light system, where ozone is created from oxygen the same way it is formed in the atmosphere. This ozone is then used as a pure oxidizer for the swimming pool. The Clear O3® acts as a continuous chemical free shock to provide the cleanest and clearest water possible. Changing UV bulbs is easy and can be completed in a matter of minutes.